The former singer of urban music now "dj" ,Lisa M posted a message and a photo on his Twitter Account, warning the gay community is not welcome in establishing Latin Star alleges. 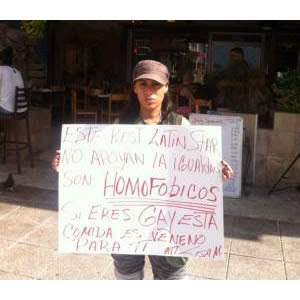 "Latin Star Restaurant in Condado, homophobic discrimination by giving me a kiss with a woman. Bahj, this is an injustice, "sets the message while facing the place shown in the image Lisa M arrest and holding a sign. "The Latin Star restaurant does not support equality. They are homophobic. If you are gay, this food is poison to you, "he wrote on the banner. About this protest, rights activist in the LGBT community, Pedro Julio Serrano, also expressed in social media hinting that a lawsuit might arise. "Solidarity with Lisa M after being expelled Latin Star Restaurant in County for kissing other women. Not lesbophobia! "Serrano wrote on social platforms. He added that it is "supporting and advising to channel his complaint in the appropriate forums." Jose Suriel, restaurant manager, confirmed the incident and stated that "we do not allow that to happen or couples straight or gay couples." He said he warned Lisa M cordially, but it continued. The employee argued that the local reserves the right of admission and having a familiar concept, "we do not agree." "We do not discriminate. Business has its rules. Did not have to get to what she did, "said the employee on the telephone. Whether admitted even in between a mother and son, or father to son, said: "A Kiss from a mother to a son can not compare with profusely kissing".